‘Dear Friend, from half a century of teaching students and young professionals in science, I feel privileged and fortunate to have counseled many hundreds of talented young people. As a result, I have gleaned a deep knowledge, indeed a philosophy, of what you need to know to succeed in science. I hope you will benefit from the thoughts and stories I will offer you in the letters to follow. First and foremost, I urge you to stay on the path you have chosen, and to travel on it as far as you can. The world needs you – badly.’ This is the powerful start of the prologue of Letters to a Young Scientist. Edward Osborne Wilson (1929) is an American biologist, specialized in myrmecology, the study of ants. From an early age he was interested in natural history. Unfortunately, a childhood fishing accident left him blind in one eye, through which he lost stereovision. He was, however, still able to see well with his remaining eye, which suited him well in the study of insects and ants in particular. Already as a child he went on expeditions to collect butterflies, ants and other insects, and also developed a keen interest in snakes. He has remained passionate about ants (and biology) and has become a world renowned scientist. Through his scientific research he has contributed to many fields; he is particularly known as the ‘father of sociobiology’ and island biogeography. E.O. Wilson is not only an interesting person because of his scientific achievements, but also for some controversial ideas regarding the role of human behavior and religion with respect to genetics and evolution. In the sociobiological view, animal behavior, including that of humans, is governed by gene expression. This means that different genes might be active depending on environment. Applying this view to human social behavior, this would suggest that we might act differently depending on our environment, but our behavior is basically preprogrammed in our DNA. Religion in his view is the product of evolution, and the submission of an individual to religious beliefs has biological advantages, so that it is a natural part of humankind that cannot be replaced by scientific thinking. These views are obviously very controversial, and not shared by all, also in the biological community. This book, however, is on a completely different topic, and in many ways much less provocative. Wilson speaks directly to young scientists and tells us that we have made the right choice and we need to stay in science for as long as we can. Since we are in the techno-scientific age, the world needs scientists badly, so he states. In the twenty letters in the book, he details his advice on how to achieve success in one of the natural sciences. He does this very systematically. In each of his letters he offers advice, based on and illustrated by his personal experiences. This means that though the book cannot be called his memoirs, larger sections of the book can be read as such, and it is these parts that will also be most appealing to a more general reader. 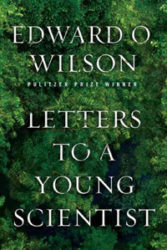 He writes in rich detail about how he, as a young Boy Scout, was a nature counselor at a summer camp, where he collected snakes and told the other Boy Scouts all he knew about them, but also about his many expeditions into the field to search for elusive species of ants. We get to know him as a man who likes to solve the puzzles nature has in store, and through this process comes to some great discoveries. For example, we learn how he observed that the number of island species of any kind in large archipelagos is correlated with the size of the island as well as its distance to the mainland. He theorized that the islands were in an equilibrium state and showed these results to a colleague named Robert H. MacArthur. And it was the latter who came up with the idea to put it in the mathematical context of two competing effects: the immigration rate of new species, which falls with the number of species, as there are no new niches for them to fill, and the extinction rate, which increases with the number of island species, as the population size decreases, which makes extinction more likely. Islands further away from the mainland have, due to the lower immigration rate, a lower number of species at equilibrium. Fascinated with this idea, Wilson sets out to find a set of islets to test this theory on. He ends up undertaking this project with one of his PhD students in the mangroves of Florida, where they remove all the invertebrate animals, while leaving the vegetation intact. Thus they find that theoretical equilibrium between immigration versus extinction holds and the new theory of island biogeography is born. The advice he gives throughout the book on how a young scientist has the highest chances of success is based on the scientific process, such as choosing a field of research that is sparsely populated, knowing your field in-depth, being passionate about your topic, having the audacity to take on big projects and questions, etc. Although some of them seem to be common sense it is great to see them summarized in the way he has chosen by illustrating them with stories from his own life. What he does not write about are some of the downsides of pursuing a career in science, for example the funding problem. Scientists are increasingly on ‘soft money’, which means that many have to apply for external sources for their research as well as salaries. Additionally, there is the two-body problem, where both partners in a couple have a scientific career, and finding a position at the same or nearby institutes can be a challenge. Nonetheless it is a great book that will be an inspiration for any young person considering whether a career in natural sciences is the path to follow.